This book is a YA coming-of-age story but it read more like adult literature. There are definite adult themes, and the descriptions that go on and on and on would probably be off-putting to teens (I know they were to me). 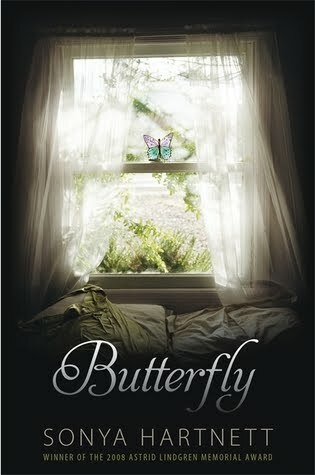 When I started Butterfly I almost thought it was going to have a paranormal twist. Reading the summary made me suspect that, and then when I started it and it seemed to be in another world, I was getting confused. The story is set in the 1970s or 1980s (it never says but that's what I suspect based on references to pop culture). Plum, whose real name is Ariella, is as awkward as could be, and I felt sorry for her the whole time. Her story brought me back to my own awkward years---memories which I try to keep suppressed. Who hasn't stood in your bedroom in front of your mirror, totally disgusted with the way you look? It's not that I didn't like this story, but I really don't think I like coming-of-age novels , the overly descriptive prose felt stilted, and the writing style felt too advanced for the age group Butterfly was intended for. The twist about where all of Plum's secret treasures really came from. Yeah, I saw it coming, but it was still great! I just added this one to my huge pile of tbr books. Thanks for the review! Hmmm another... I think I will keep this one for when I have very little choice but category. Thanks for an honest review.